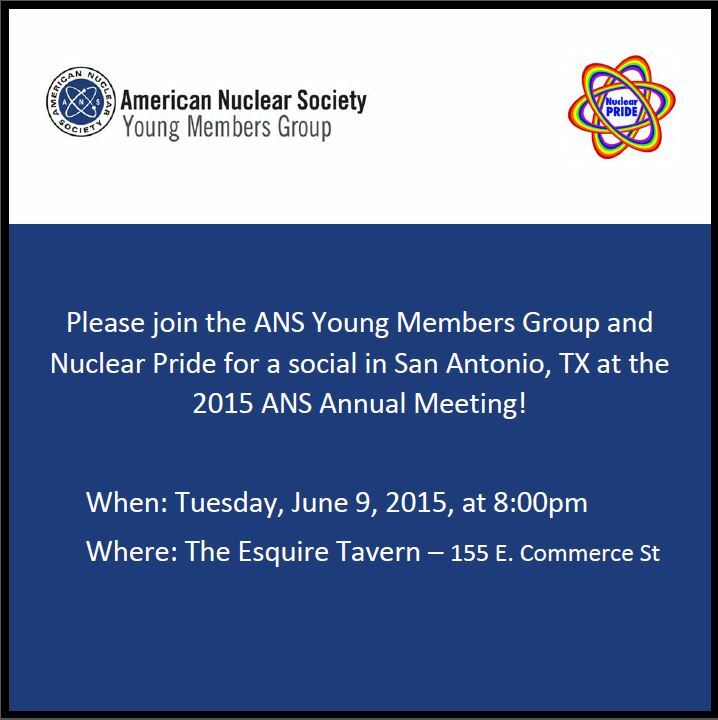 Nuclear Pride Social at ANS Winter Meeting 2014 in Anaheim California! 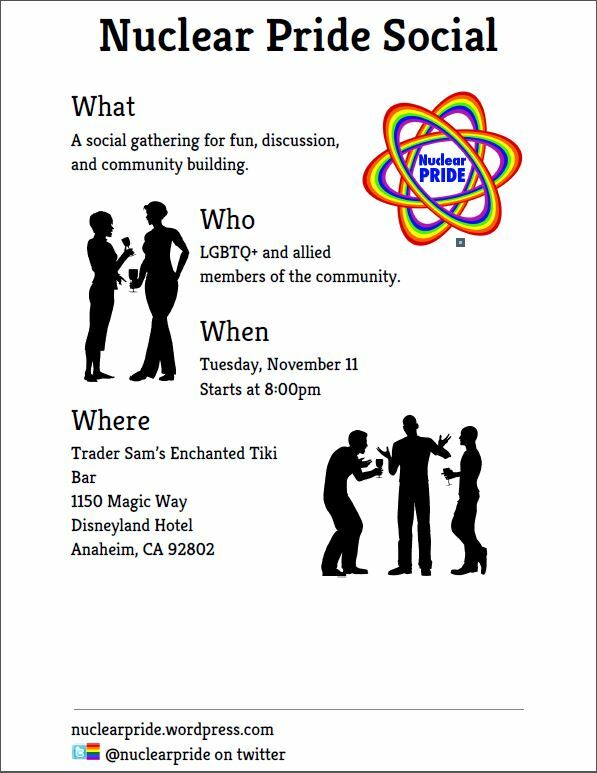 Nuclear Pride will be hosting a social at the Trader Sam’s Enchanted Tiki Bar on Tuesday the 11th at 8:00 p.m. We will be gathering together with members of the nuclear engineering community for fun, discussion, beverages, and community. Additionally, the Tiki Bar has a full food and bar menu. It should be easy to find, as it is in the conference resort complex. However, please do let us know if you have any questions or need help getting there. Respond to this post or tweet @nuclearpride for the swiftest response. You can also send us an email at nuclearpride-exec@googlegroups.com. We’ll be there at least until 10 p,m. In addition to connecting with a community of LGBTQ scientists and allies, we hope to share with you the initiatives we’ve been pursuing and want to get interested folks on board for additional plans! In particular, we’ll welcome feedback on the Member Needs Assessment Survey. Please share this announcement with friends! Next week at the American Nuclear Society winter conference in Reno, NV, Nuclear Pride will gather with members of the nuclear engineering community for fun, discussion, beverages, and community. On Tuesday night, June 17th, at 8pm we’ll meet at The Reserve in the Grand Sierra. The reserve is a ‘self-serve’ wine bar in the Grand Sierra, on the Casino Floor. The bar does have a limited snack food menu, but the focus will be wine, so fuel yourself accordingly! We’ll be there at least until 10pm. In addition to connecting with a community of LGBTQ scientists and allies, we hope to share with you the initiatives we’ve been pursuing and want to get interested folks on board for additional plans! In particular, we’ll welcome feedback on the Member Needs Assessment Survey. The summer of 2010 brings back memories of long days of amazing research at the Argonne National Laboratory and long weekends in Chicago’s Boystown celebrating Pride and summer with my LGBT community. Me being “out at work” wasn’t a very big topic of conversation but I never felt directly attacked or empowered. It was an Illinois summer of adventure, academically and personally. I understand not being open and out in the workplace. It isn’t always easy and the conversations rarely come up. Not all conversations are positive, of course, and many remind queer employees of the stigma and prejudice we are under. My advisor for the summer knew I was gay and has been one of the most supportive people in the field on these matters. The challenge was that he could support me however much he wanted to, but the State of Illinois would never recognize me as his equal in terms of our relationships. And relationships matter. That all changed on November 20th, 2013 when Governor Pat Quinn signed the Religious Freedom and Marriage Fairness Actl into law which provided marriage equality to the citizens of Illinois. The law will go into effect June 1st, 2014 making a grand total of 16 states and the District of Columbia to have enacted marriage equality. This is a monumental moment for me personally. My work at Argonne National Laboratory was exciting and challenging. I would definitely consider returning in the future to continue my research. But the specter of marriage inequality had definitely crossed my mind and made me think twice before actually pursuing that option. Now that marriage equality has been enacted there I can more honestly consider moving to the great State of Illinois and starting a family. I’m not the only student to think twice before taking a job based on the locale and my chances of finding a supportive community. There are sure to be hundreds of young LGBT nuclear professionals looking to start a family or a settle into a home. Until the other 34 states bring marriage equality forward we will be forced to consider a balance between our love of neutrons and the loves of our lives. The United States has come a long way in advancing LGBT rights in the last few years: sixteen states (counting almost-there Illinois and Hawaii) now have full marriage equality laws, the US military repealed Don’t Ask, Don’t Tell (DADT), and the Supreme Court both ruled the Defense of Marriage Act (DOMA) unconstitutional and allowed the overturn of California’s Proposition 8. However, while we have federal laws in place against discrimination on the basis of race, gender, national origin, color, and religion, we have historically fallen short in passing federal laws to protect lesbian, gay, bisexual, and transgender employees in the workplace. According to a recent poll, most Americans support this legislation, and a surprising 80% of those polled think that such federal workplace discrimination protections are already in place. Despite some states enacting workplace protections for LGBT employees to make up for the lack of federal protections, 29 states still allow workplace discrimination based on sexual orientation, and 34 states lack workplace protection based on gender identity. How does this affect nuclear engineering professionals? A large portion of the US nuclear workforce lives and works in states without this important legislation in place to protect the LGBT minority from discrimination on the basis of sexual orientation and gender identity. We are now at a critical juncture. Just last week, the US Senate passed a historic measure to end workplace discrimination, the Employment Non-Discrimination Act (ENDA), in a 64:32 vote. Now, it is up to the House to vote on it. Unfortunately, Speaker John Boehner and many of his fellow Republican Representatives oppose the legislation for reasons that make little sense. Why is it imperative that we, the nuclear community, speak up about the ENDA issue? The US nuclear workforce (nuclear power and technology companies, vendors, utilities, and national laboratories) is scattered among states where state-level nondiscrimination laws may not exist. Although not comprehensive, current Bureau of Labor Statistics data show that a significant portion of nuclear engineering professionals live and work in states where they are not protected against discrimination in the workplace. Among them, according to a recent Gallup Poll, an average of 3.5% is estimated to be lesbian, gay, bisexual or transgender. (Keep in mind that these are self-reported data, and the actual numbers may be much higher in reality.) This means that too many of our friends and colleagues are either not hired, denied a promotion, or go to work every day knowing that they could be fired as a result of someone’s personal judgement about their sexual orientation or gender identity. In the private sector, some corporations craft their own nondiscrimination policies to fill in the gaps presented by the potpourri of state-level nondiscrimination laws. The Human Rights Campaign (HRC) ranks US corporations based on its equal treatment of LGBT employees with the Corporate Equality Index (CEI). According to the 2013 CEI report, we can applaud the nuclear-related companies which rank highly on the CEI: Illinois-based Exelon as well as California-based Southern California Edison and Pacific Gas & Electric all have perfect scores. (These corporations meet all the rating criteria, which go well beyond the bare minimum of nondiscrimination policies.) Companies such as Entergy, Dominion, Duke Energy, and General Electric are close behind (though they mostly lack transgender-inclusive health insurance coverage). Unfortunately, there are countless more corporations in the nuclear industry that did not make it to the CEI report at all. Some relevant corporations have not responded to repeated invitations to participate in the CEI survey, and are thus unofficially ranked with a very low score (based on public information). A federal nondiscrimination law would at the very least require all LGBT employees to be protected from discrimination in any workplace scenario (with some exemptions such as at religious organizations). In general, diversity is essential to the health of any workplace. It is important for the nuclear industry to understand that young talent will undoubtedly be attracted and retained more successfully if there is clear advocacy for diversity, which includes support for the LGBT community. Protecting lesbian, gay, bisexual, and transgender people from potentially losing their job due to discrimination would be a step in the direction for needed cultural shift in the nuclear workplace. It is fitting to note that the NuclearPride executive committee has received overwhelmingly positive feedback, from both the LGBT nuclear community and its allies, simply for the creation of NuclearPride and its positive contribution to the image of the nuclear community. We, as young professional nuclear engineers, believe that generating excitement for an inclusive and dynamic workplace is essential for the attractiveness of the field and overall morale in the workplace. The more the nuclear industry can make itself a collection of diversity-supportive employers, the more the field will benefit from young talent and grow in the long term. Nuclear engineers, call your representatives! You have strong arguments in favor of passing ENDA. We are, as a country, without protections for our LGBT workforce, and many of our own colleagues are affected by working in states without this protection. An overwhelming portion of the US population supports expanding already-existing workplace nondiscrimination laws to include sexual orientation and gender identity, and it is time that our representatives in Congress start listen to their constituents. As nuclear engineers and LGBT leaders in your community, we implore you to action to bring the United States of America one step closer toward full equality for all its citizens. Join us for a social hour at Nellie’s in DC! Next week at the American Nuclear Society winter conference in Washington, DC, Nuclear Pride will gather with members of the nuclear engineering community for fun, discussion, beverages, food, and community. Here’s a flyer to share with friends ! On Wednesday night, November 13th, at 7pm we’ll meet at Nellie’s Sports Bar. Nellie’s is an LGBT+ friendly place with food and beverages. Reportedly, there’s sometimes trivia on Wednesdays, so sharpen those minds! Nellie’s is located at 900 U St NW. It should take about 15 minutes to travel there from the Omni Shoreham on the 90 or 96 bus line. If you’d like to travel to the venue with us, we’ll meet in the lobby of the Omni Shoreham at 6:45pm. Let us know if you have any questions or need help getting there. Respond to this post or tweet @nuclearpride for the swiftest response. You can also send us an email at nuclearpride-exec@googlegroups.com. We’ll be there at least until 9pm. In addition to connecting with a community of LGBTQ scientists and allies, we hope to share with you the initiatives we’ve been pursuing and want to get interested folks on board for additional plans! Next week at the American Nuclear Society conference in Atlanta, GA, Nuclear Pride will gather with members of the nuclear engineering community for drinks and chatting. On Tuesday night, June 18th, at 8pm we’ll meet at Blakes on the Park. Blake’s is a family bar with food and music, suggested to us by a local Atlanta Nuclear Pride member! Reportedly, there’s sometimes karaoke on Tuesdays, so divas will want to practice their Donna Summer voices, just in case. It should take 15 minutes to travel there from the conference location, as it’s at 227 10th St. NE in Midtown, just three stops north of the Peachtree Station on the gold MARTA line. If you’d like to travel to the venue with us, we’ll meet at the conference registration desk at 7:40pm. Let us know if you have any questions or need help getting there. Respond to this post or tweet @nuclearpride for the swiftest response. You can also send us an email at nuclearpride.contact@gmail.com. We’ll be there for at least an hour. In addition to connecting with a community of LGBTQ scientists and allies, we hope to share with you the initiatives we’ve been pursuing and want to get interested folks on board for additional plans! Social Hour in Phoenix AZ! Tonight, Nuclear pride will meet up with members of the waste management community for drinks and chatting in Phoenix, Arizona! At 8pm, we’ll meet at at Amsterdam, a club at 718 N. Central Avenue, just north of the Phoenix Conference Center. The special tonight at Amsterdam is $5 martinis, so don’t forget to bring a couple of Abe Lincolns along! We’ll be there for at least an hour. If you’d like to walk to the venue with us, we’ll meet at the starbucks at 7:45. I can’t tell you how frightening and yet terribly exciting it was for me to attend my first NuclearPride social in Chicago last summer. 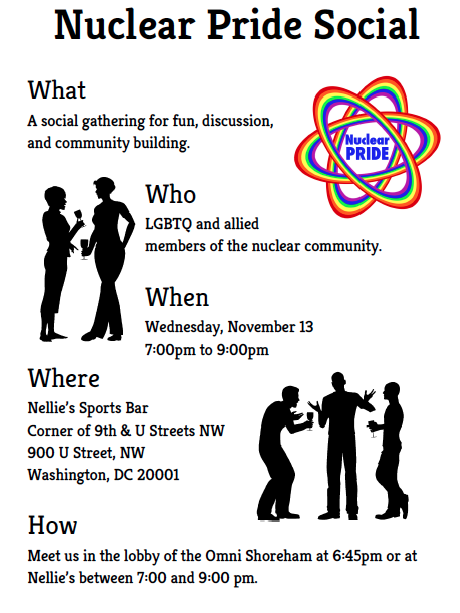 An amazing ally in the American Nuclear Society had shared a poster with me about a new group for LGBTQ nuclear engineers and their allies which was having a social hour at a local bar the next evening. Walking into that room I was full of questions. How many people would show up? Was there only going to be allies? Were there really other LGBTQ nuclear engineers? When I saw Katy I was terribly confused. You see, I had just seen Katy present her research in my session that day. We worked on very similar research topics and I knew she would recognize my face. She smiled at me. I was terrified at first because I didn’t know if she was at the bar with friends and would see me in the LGBTQ social hour. She invited me over to sit down and I would learn she had helped to organize the event. Waves of relief! Katy wasn’t the only ANS colleague I would know at this social hour. With allies and friends we were joined by almost 20 individuals. Talk about empowerment! I was beaming with an instant sense of acceptance and support. I would finally be able to be myself in my professional society and this social was bringing together a community who wanted the nuclear science and engineering field to be supportive of all of its members and especially its LGBTQ family. Our next social hour would be held in San Diego during the winter ANS meeting. Announcing the meeting during the student sections committee meeting was nerve-racking but the smiles and new faces that attended made it absolutely worth it. We were also joined by the QuEST (Queer Engineers, Scientists, and Technical Professionals) who shared their experiences with hosting similar events and outreach. The collaboration of the queer nuclear world with the queer scientific community of San Diego was just the start. Our future events will work to be held with local organizations which support our mission of providing a safe and supportive community for those who identify as lesbian, gay, bisexual, transgender, or queer in the nuclear engineering community. 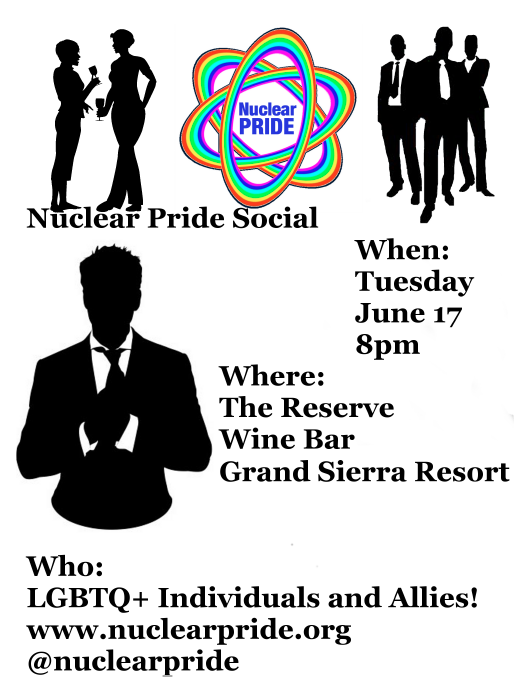 As a young queer nuclear engineer I am blessed to be part of the NuclearPride community and can’t wait to see you at the next social event!